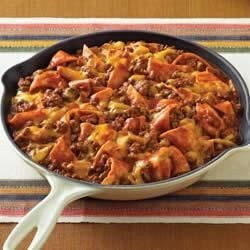 "Favorite flavors of the Southwest, featuring salsa, tortillas and melted cheese, will make this easy skillet supper a family favorite." Cook beef in 10-inch skillet until well browned, stirring to break up meat. Pour off fat. Stir in soup, salsa, water, tortillas. Heat to a boil. Reduce heat to low and cook for 5 minutes Stir. Top with cheese. Burgers never need to be basic again! Try this great recipe with dipping sauce. Stir in 1/2 cup sour cream with soup. Use corn tortillas instead of flour tortillas and shredded Mexican cheese blend instead of Cheddar. Big hit with the family. I also added drained diced tomato and chili beans to bulk it up, and add a bit more protein. We loved it. Excellent! I added macaroni, taco seasoning and kidney beans. I didn't use tortillas. My husband loved this, it is a keeper! Thanks!